You’re probably already familiar with the bright, upbeat sound of major chords and the dark, mournful vibe of the minor variety. Sus chords have a different sound altogether. On the spectrum of moods, these are neutral-sounding fence-sitters, neither happy nor sad, and with a curious tendency to pull you back to a major or minor chord. 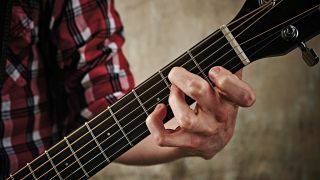 For this reason, sus chords are nearly always mixed in around their major and minor brethren. Listen to the acoustic guitars in Pinball Wizard by The Who or Crazy Little Thing Called Love by Queen to get a feel for the sound. Major chords use the first, third and fifth notes of the major scale. Sus4 chords drop the 3rd interval and replace it with the 4th - a process known as ‘suspending’, which is why it’s called a sus chord. First of all, you’ll see the notes of the C major scale. Bar 2 shows you the notes of a Csus4 chord - which, remember, uses the first, fourth and fifth notes of the scale (C, F and G). C-Am-G is a simple chord progression that crops up in many songs. Stick a sus4 on the last chord as we’ve done here to bring the progression to life and make a feature of the change to G. It sounds great in acoustic folk and mid-tempo rock, but overuse the effect and your music may sound hymn-like. A sus2 chord is the same as a sus4, but using the second note of the scale instead of the fourth. So, for example, a Csus2 chord has the notes C, D and G.
Try out these simple sus chord variations on some of the open shapes you probably already know.